This popular bouquet has two dozen fresh roses in a dazzling array of pastel shades, perfect as an expression of your true feelings! 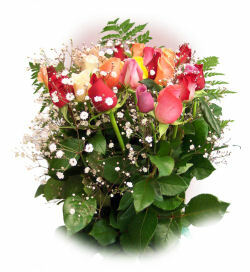 The bouquet can feature red, or multi-color roses. A lovely gift! These roses are a floral arrangement of fresh cut flowers and are cut fresh daily from our greenhouses and are dethorned to make it a less painful process to put them in a vase. This price includes SHIPPING via Standard Service in a custom box with gel-ice pak and individual water tubes on each stem to retain its freshness.